"This is a family favorite that we make year-round." Score ham by making 1/2-inch deep diagonal cuts, creating a diamond pattern; transfer ham to a roasting pan. Mix brown sugar with enough yellow mustard to make a smooth, pourable sauce. Pour reserved pineapple juice over ham, followed by the honey. Pour brown sugar mixture over honey and arrange pineapple rings decoratively atop ham. Secure pineapple rings with toothpicks. Bake in the preheated oven until diamond pattern on ham splits open, 1 to 1 1/2 hours. Baste ham every 15 minutes with pan drippings. Cola does flavor-building wonders for baked Easter ham. 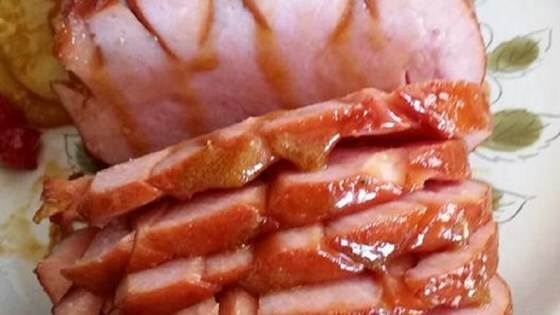 Made this ham recipe for Easter this year. My husband said it was the best ham he ever ate. I made the recipe exactly as posted. I wouldn't change a thing. I messed up and mixed the pineapple juice with the brown sugar, mustard, and honey. I brushed it on and the end result was fantastic! I followed the recipe exactly and it was perfect. Made as written, aside from only basting a couple times, and was very tasty. Good glaze.